This mitt design was created to compliment the Mountain Peak Hat and Mountain Peak Cowl, but they are pretty enough on their own as well. This pattern has been tested and tech edited. The instructions are both written and charted. The mitts are knit in the round from the bottom up and have a beautiful cable and lace pattern up the back of the hand. 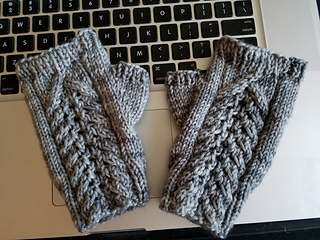 The mitts are 6” long and will fit an approximately 8” hand circumference. Yarn: Miss Babs Heartland (100% merino) 250 yards per skein or 100 yards of a worsted weight wool. 4 mm (US 6) circular or double-pointed needles or size needed for correct gauge. Gauge:17 sts. x 28 rounds per 4” in stockinette after blocking.